Are you a thankful person? Do you ever think about what your life would be like without certain blessings? Robert Emmons, touted as one of the world’s leading experts on the science of gratitude, says that “one effective way of stimulating gratitude” is to reflect on what you would be missing without the people, places, or possessions you value. Some people are simply grateful for daily bread, like the two brothers cited in a Random Act of Kindness story published in AARP November 2015 issue. But then they got the surprise of their lives! David Parsons, then age 5, remembers a time when his Dad on the way to share a Thanksgiving dinner with him at school stumbled upon two brothers whose parents couldn’t afford the quarter for each of them to enjoy turkey and pumpkin pie. David’s dad noticed the boys on the steps of the lunchroom, trying to hide their humble sandwiches wrapped in wax paper, looking down at their feet in embarrassment. Dad stopped with his hand on my shoulder. The expression on his face softened. He dug into his trouser pockets and found two shiny quarters. He called the boys by name and said, “We will all eat turkey and dressing today.” He gently pressed a quarter into each of their hands and opened the lunchroom door. Gratitude can be expressed with our eyes open, our hands relaxed, looking straight ahead. 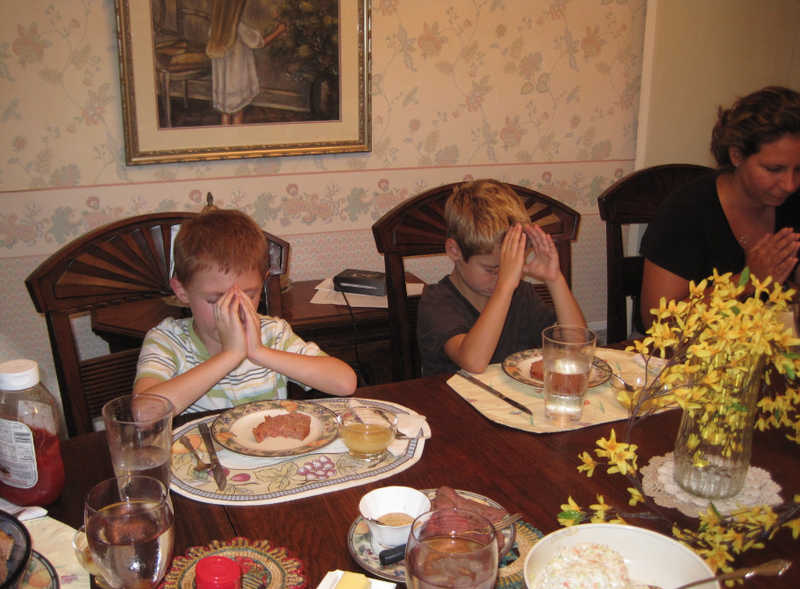 But during this season of thanksgiving, it is lovely to contemplate eyes closed in gratitude, hands clasped in praise. Pudgy hands and some slightly older hands held in gratitude . . . 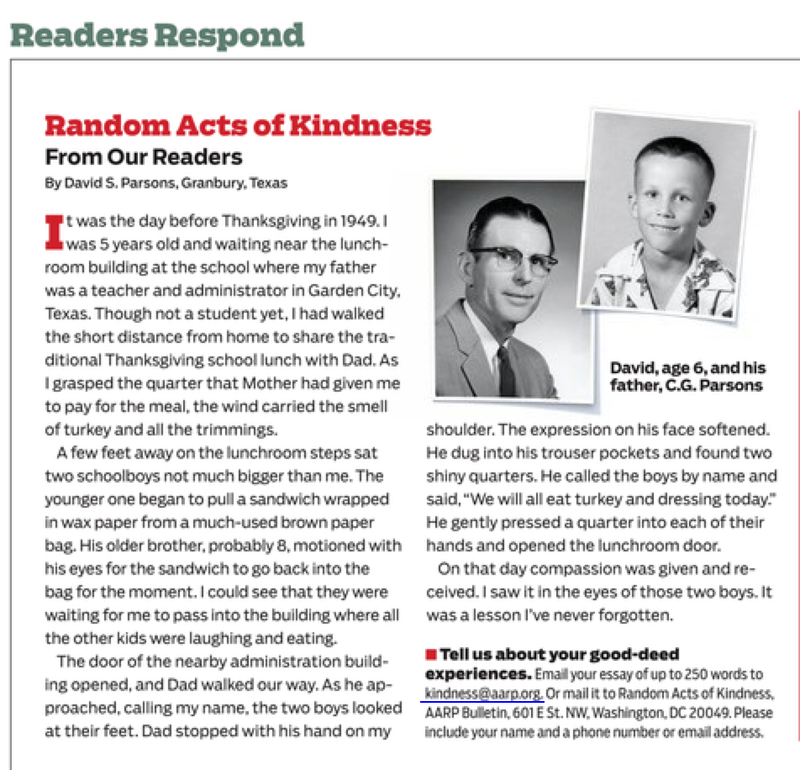 If David Parsons’ story in the introduction sparked an incident you can recount from your own experience, tell your good-deed experience in 250 words or less and submit it to kindness@aarp.org (Please cut and paste this link into your own browser.) You may be chosen to feature in a future publication! You are first responder today, Fatima. Happy Thanksgiving to you and your family too! Me too! I’ll be a hypocrite if I don’t “practice what I preach” here. I know you will enjoy a wonderful Thanksgiving with your extended family, and we’ll probably hear a litany of praise on Monday – enjoy! Marian, you are such a good weaver of stories and opportunities to tell and preserve them. This post is wonderful. When I worked at the Fetzer Institute, Robert Emmons and David Issay, the founder of Story Corps, both came to my attention. There is so much to be grateful for in our troubled world. Today I am grateful for you and this lovely blog. You are have connections to people with powerful and positive messages. World news feels worse these days simply because we hear all about it sooner and with much more force because of media attention + the vitriol attached to how viewers respond. The Fetzer Institute dedicated as it is to a message of hope and peace does much to counteract that. I have been following the excitement at your most recent writers’ retreat on Facebook. You are living life to the hilt! Bless you for your expressions of gratitude. I accept that, Shirley. And Happy Thanksgiving to you and your family! You are welcome, Darlene! I believe the Canadian Thanksgiving is celebrated earlier in November. But now that you are in Spain, you can celebrate any day you choose – right? Canadian Thanksgiving is the second Sunday in October. I wished everyone in Spain a Happy Thanksgiving and they loved it. They had heard of American Thanksgiving but not the Canadian celebration. I tend to be thankful everyday!! Your gratitude is apparent in everything I see on your website. True thankfulness cannot be contained and spills out to bless others. Thanks for commenting again, Darlene. Happy Thanksgiving Marian. Our celebrations are mid-October, but I don’t mind celebrating again. I have friends -he’s Canadian and she’s American…so they celebrate both with all the trimmings! Yum! Thanks for setting me straight on the Canadian Thanksgiving date, Jenn. I like your friends’ response to the double holiday – celebrate twice! Thanks for the compliment, Jenn. Sure thing! What a wonderful post. It’s amazing the love one can show with such a small gesture. Although that was a huge thing for those boys that day. I praise God for so many things in my life. A great one is the blessing to have and am a part of your family being my family. Last night Mark called me at 9:00pm. You know it’s 10:00pm in PA. Worried about me because he saw the shooting on the streets if Chicago. I assured him I’m an hour away in a very safe town, so he was relieved. I feeling so happy that he love and worries about me. What a wonderful moment for me my eyes got teary. My friend that was over asked is everything all right . I smiled said yes my spiritual brother was worried about us . God is solid good to for all the wonderful people he has placed in my life. May you my wonderful spiritual sister have a lovely Thanksgiving. I had to smile when I read about Mark’s response to what he saw on TV. That is SO like him! He used to call us when he saw a hurricane heading toward Jacksonville. Usually the press made it worse than it was, as far as our city was affected. Still, he cared! Yes, it is such a blessing that we share “family” in more ways than one, Gloria. Happy Thanksgiving! 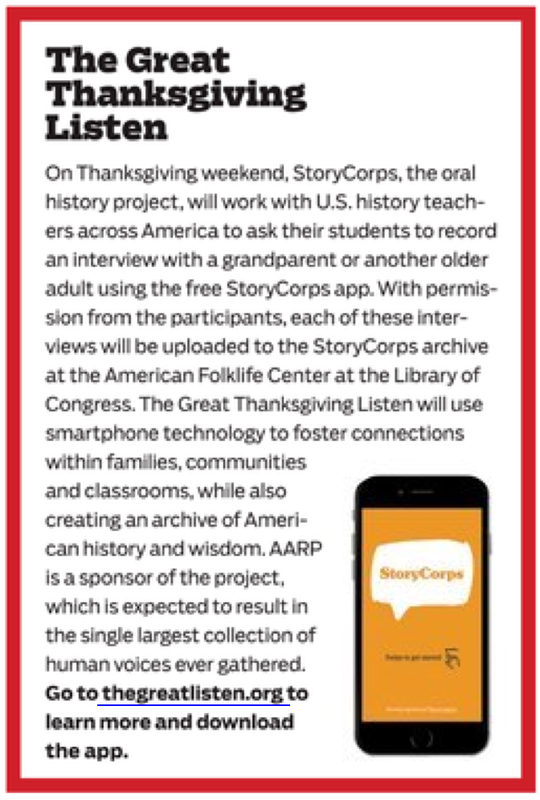 Marian — Thank you for this lovely post and links to the Storycorps Thanksgiving project. What better harvest could there be than consciously gathering awareness of all the good in our midst. . . collectively giving thanks for all we have, all we have to give, and all we receive. Marian — In an effort to mesh schedules,we’re celebrating Thanksgiving with Evan this coming Saturday. Thank you, Marian, for including us in your enjoyable ‘harvests.’ I love to find how you gather thoughts and memories and quotes and share them with us. I’m glad we have three connections right now: Facebook, this blog, and our writing class. Happy Thanksgiving to you and your family, Dolores! And of course, happy writing. Really – I didn’t know that – cool! Ah, the difference two shiny quarters–and a good heart–can make in the lives of so many. We take AARP and yet reading this in your post, followed by beautiful pudgy hands clasped in prayer, gave thankfulness new meaning. Thank you, Marian, and Thanksgiving blessings for you and your family. We both know that the best way to counter the vitriolic exchanges in this sad world is to broadcast the good. I have read so many examples of that on your own blog post, particularly excerpts from your mother’s teaching life. Love, joy, peace to you and yours during this happy season, Marylin. Happy thanksgiving Marian such a delightful post thank you for the link . We obviously don’t celebrate thanksgiving over here in the UK but I think we should because we have so much to be thankful for . You might be grateful to us for responding but we are grateful for such inspiring posts from you every week . I have learnt so much about your life and wonderful county …thank you . 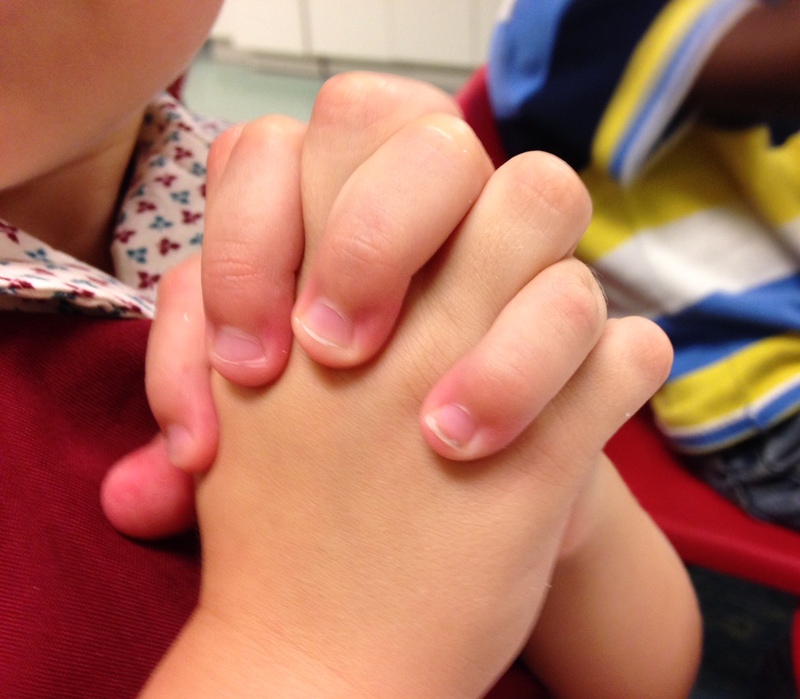 Those hands belong to the two-year-olds I “teach” in Sunday School. They are precious little people. What a lovely story of kindness. I’m glad you enjoyed it, Fiona. Thank you so much for your daily offerings of beauty. I’m off to check out the “Tutus” photos you posted today! I can certainly relate to your last two sentences. Yes, we have enjoyed a wonderful Thanksgiving together. When I got back home, I downloaded your new book on my Kindle/Mac – great reading for a semi-lazy weekend. Brava, Debby! Yes to the power of love and giving. Thanksgiving gets my vote for best holiday. I loved driving through Ithaca on the way to a friend’s house and seeing quiet roads, empty parking lots at a shopping mall, and dark storefronts. I’m sure today is a mad house (I’m staying home), but I love the pause. For just a few hours, most of a day, praise is more important than commerce. Yes, I think our losses come in to sharper focus on holidays. My heart ached this week for my mother who has been gone now for two Thanksgivings. My condolences to you as your mark the 7th year without Vic. Crying doesn’t fix things, but it helps us vent. Thank you for sharing David Parsons’ story. A little kindness goes a long way. His Dad really handled the situation with compassion. We are blessed with fine families – and the occasional snafu. I can tell you are enjoying this last year of teaching, savoring each month as it passes by. Your stories about students on Facebook are gems. Thanks for stopping by again for a visit, Judy. What a lovely thanksgiving story. I’m sure those boys remembered that small act of kindness all their lives. And so did the dad and his son – glad you enjoyed this, Marie. And thanks for commenting here often. I wonder where your wanderings (travels?) will take you to next . . .
That is something we haven’t yet agreed on. I’d like to go back to visit our friends in Normandy. It’s been way too long. When I think of Normandy, I think of its beaches and history classes about the 2nd World War. But there is also the mythical castle there too, Mont St. Michel. If you have friends there, you have a good excuse to go again.